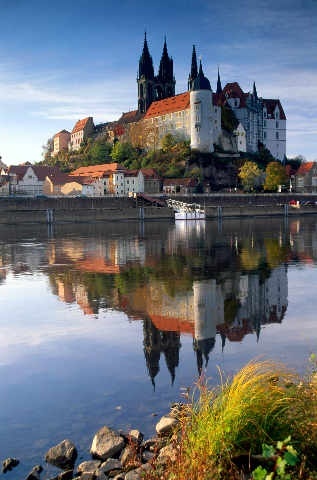 The Albrechtsburg is a Late Gothic castle that dominates the town centre of Meissen in the German state of Saxony. The adjacent Gothic cathedral was the episcopal see of the Bishopric of Meissen established by Emperor Otto I in 968. The present-day hall church was built between 1260 and 1410, the interior features Gothic sculptures of founder Emperor Otto and his wife Adelaide of Italy as well as paintings from the studio of Lucas Cranach the Elder. The first Saxon elector from the House of Wettin, Margrave Frederick I, had the Prince's Chapel erected in 1425 as the burial place of his dynasty.